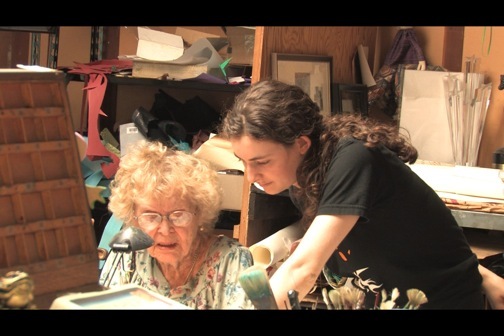 Jewish Art Salon: Butterfly Summers: A Memoir of Gloria Stuart's Apprentice. Butterfly Summers: A Memoir of Gloria Stuart's Apprentice. Deborah B. Thompson, a master's student at the Jewish Theological Seminary in the Jewish Art and Visual Culture program and a member of Toby Kahn's Artist-in-Residence program, has just published her first ebook titled Butterfly Summers: A Memoir of Gloria Stuart's Apprentice. The memoir is a vivid glimpse of the relationship between the accomplished painter, fine printer, and actress Gloria Stuart (1910-2010), best known for her role as old Rose in the blockbuster film Titanic, and her great granddaughter turned apprentice, Deborah. A powerful bond develops between them as they work for summer after summer on Gloria's masterpiece, a set of hand-made artist's books in the shape of giant, flying butterflies, and endeavor to complete them before it is too late. Butterfly Summers is available on Amazon Kindle: http://www.amazon.com/dp/B007RH743A and is coming soon to Apple iBookstore (for iPad) and Barnes & Noble (for NOOK).